Installation view featuring (left to right) Shinique Smith, Roberto Visani and Maren Hassinger. Sedimentations: Assemblage as Social Repair is the most recent exhibition at The 8th Floor, an alternative art space affiliated with the Rubin Foundation and dedicated to expanding artistic and cultural accessibility in New York City. The title of the exhibition drums up images of geological striations, the historic record, and the trajectory of civilizations, to only name a few reference points. As curator Sara Reisman, Executive and Artistic Director of the Shelley & Donald Rubin Foundation, explains in the opening exhibition statement, the title comes from a 1968 essay written by the influential land artist Robert Smithson. In his text, Smithson broadly explores how humans relate to the earth in every sense. The critical writings and socio-environmental practices of Smithson serve as an important conduit for understanding the cogent narrative of this exhibition and its larger themes. At the same time, I would argue that the essays of the French postmodernist thinker Michel Foucault equally provide an appropriate and useful framework for seeing how the installations on display are linked. Reisman has judiciously brought together a formidable cadre of artists, including El Anatsui, Maren Hassinger, Elana Herzog, Samuel Levi Jones, Mary Mattingly, Lina Puerta, Michael Rakowitz, Jean Shin, Shinique Smith, Mierle Laderman Ukeles, Roberto Visani, and Michael Kelly Williams. These twelve artists of varying art historical moments, media, and motivations are part of an intellectual journey about material usage, objecthood, and artistic intervention/re-purposing in the life of discarded items. Concurrently, the objects and installations in one way or another comment on the visible and invisible systems that operate in our daily lives. The myriad assemblages pulsate a Foucaultian energy and speak to social ills/systems in desperate need of repair, such as waste collection and management; gun regulation; urban planning; emergency response efforts; the fashion industry; museum acquisition policies and cultural patrimony; and the military-industrial complex. The show does much more than raise questions about these systems though; it offers potential remedies to some of the most deleterious socio-political ails of our time. As Reisman explains in the catalogue essay, each “artist offers a methodology that speaks to a crisis, from the personal and intimate to the global and collectively consequent.” I have divided my analysis and assessment of the exhibition into two broad categories, attempting to elaborate on the major themes and issues as one would encounter them while progressing through the gallery space. In the first section, I consider works and themes dealing with the history of civilizations; cultural heritage; gun violence; natural disasters; the circulation of power; natural resources and the U.S. military; and the American judicial system. The latter half is concerned with the fashion industry; the geo-politics of the developing and developed worlds; nature, architecture, and culture; and shared public places and urban social theory. El Anatsui, Metas II, 2014. Found aluminum and copper wire. ©El Anatsui. Courtesy of the artist and Jack Shainman Gallery, New York. 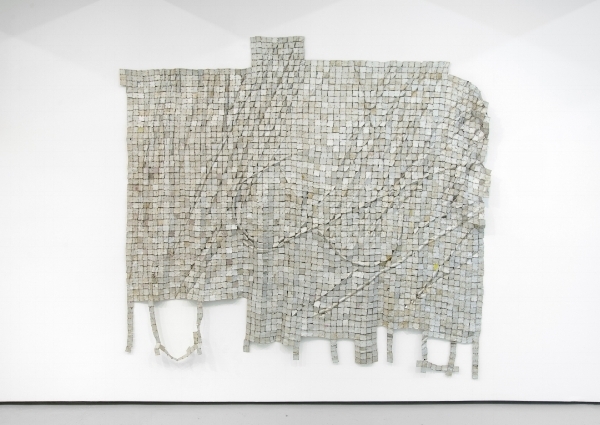 The show is introduced by the artistic triumvirate of Visani, Anatsui, and Laderman Ukeles, who all wrestle with notions of transformation, past lives, the accrual of new meaning in discarded objects, and the history of civilizations. Visani’s cast models of firearms [Figure 1], which simultaneously resemble pre-historic fossils and ancient stelae, were produced from guns confiscated by the Patterson, New Jersey Police Department. Like Laderman Ukeles’s involved project with the New York City Department of Sanitation in the late 1970s, Visani partnered with a local municipality. Instead of carrying out an extended socially engaged performance to bring attention to the largely unseen labors of trash collection though, Visani is more concerned with giving new life to products of destruction. Through this transformation in function the artist strips the referent object of its life-altering power, comparable to how Pedro Reyes converts guns into musical instruments. The sculptures found throughout the gallery espouse a hope for a future where guns are less ubiquitous—an artifact or thing of the past. In El Anatsui’s nearby rippling metal sculpture entitled Metas II (2014) [Figure 2] he has re-worked aluminum bottle caps into tiles that form a shimmering sheet reminiscent of mosaics or tapestries, art forms traditionally associated with wealthy societies at least in the Western artistic tradition. I see the work of these three artists as being linked by the topos of the cycle of great civilizations and the archaeological record. This is more apparent in Visani’s work because of the strong formal associations with fossils, but the idea also runs throughout the photographic and documentary archive of Laderman Ukeles’s project because in the end her performance implores us to ask how our society will be understood as seen through the detritus and banal items we leave behind. Further, these first works that welcome visitors to the show implicitly ask us to consider the fates of past civilizations and how the concentration of power coupled with greed led to their respective downfalls. Michael Rakowitz also deals with the history of civilizations and cultural heritage, though, in a markedly different approach that encompasses a different set of issues. In his intriguing vitrine of small works titled May the Obdurate Foe Not Stay in Good Health from 2016 [Figure 3], the artist addresses questions about cultural erasure and the role of artifacts in the construction of historical narratives. These ten false artifacts may be understood as attempts at cultural repatriation by artistic proxy. Rakowitz’s actions remind us that the artistic act can be one of recovery and generation. The artist himself describes these items as ghosts coming back to haunt the living, urging us to be better stewards of our cultural heritage. Much like Visani’s use of original objects to explore afterlives, Rakowitz uses Syrian food packaging and newspaper to re-construct lost objects of the ancient Near East. While Visani uses his molds/sculptural reliefs to lodge criticisms of American gun laws, Rakowitz is interested in using his re-constructed items to address the black market for antiquities, and by extension museums’ complicity in these transactions. In one text panel, the artist includes a sobering quote by Sam Hardy: “The Industry runs on trust. By not keeping any records, dealers make it easier for buyers to convince themselves there is no evidence of any wrongdoing.” The viewer is left to consider how we might mend this cycle of war, looting, exchange, and museum display. When Rakowitz’s objects are considered in light of the works by Visani, Anatsui, and Laderman Ukeles one begins to think about how the objects left behind by societies of the twenty-first century will likely reveal a story of concentrated wealth and mal-apportioned global resources. Linked to this idea of civilization and destruction is Elana Herzog’s Valence (2014/2018), encapsulating many of the guiding motifs and critiques of the show. Inspired by the quilts of Anni Albers and the Bauhaus movement, Herzog has meticulously constructed and arranged layers of wood, drywall, and steel shelving posts with paint, textiles, and staples [Figures 4 & 5]. The composition is a veritable tour de force with much of its thrust residing in the indexical power of the materials chosen. Undeniably, Herzog’s work calls to mind destruction, either in the wake of a natural disaster or perhaps the apocalypse. The artist seems to peel away layers of urban fabric in order to show us the underlying structures of urban planning, and how in most American cities these layouts reflect biases about race and class. The fabrics and construction materials further bring to mind images of domestic architecture and infrastructure. At the same time, seen from a distance, the boards and colorful, tattered textiles resemble aerial maps or rather zoning maps. All maps reflect power relations because the choice of what to represent and what to marginalize or silence is always operating underneath the cartographic surface. As well, maps indirectly reveal the circulation of power, wealth, and resources. Herzog taps into and gives visual form to the rich critical discourse on maps and knowledge production, adeptly and gracefully combining all of these various associations and references in a singular installation. In my view, within the larger framework of the exhibition, Herzog’s work becomes a powerful critique about climate change, the growing intensity of natural disasters, and how governments (mis)manage emergency response systems. Whereas Herzog is primarily concerned with natural disasters, Mattingly’s side gallery is dedicated to aspects of human destruction by way of the military-industrial complex along with the exhibition’s themes of objecthood and global power dynamics. This small room is an investigation into cobalt extraction, labor, nationalism, and weapons production featuring chromogenic prints, an elaborate small-scale installation, and three cobalt-alloyed gun barrels encased in a pristine white frame. As several didactic panels explain, cobalt is an element used for household and technological goods, with the U.S. military consuming 60% of the world’s supply. Like Visani, Mattingly demonstrates that the life of raw materials is determined by human intervention or action; there is a tension in their potential usage. As seen through the visual feast that is Mineral Still Life (Cobalt and Nickel) [Figure 7], Mattingly shows how the element cobalt can be used as crushed pigment in oil paints, part of glazes for ceramic wares, or key components in instruments of war and destruction. This dichotomy is first presented in Visani’s sculptures and later amplified in Mattingly’s works. What is more, Mineral Still Life (Cobalt and Nickel) in tandem with Cobalt Map (2016) serve as elaborate diagrams for mapping out modes of production and the flow of power. In this regard, Mattingly’s work is conceptually tied to the larger installations by Herzog in the main gallery space, but in my estimation Herzog deals with these ideas in a more abstract and artful manner. Samuel Levi Jones’s Gris from 2017 [Figure 6] touches upon some of the evocative themes and questions presented to viewers for contemplation in the works of El Anatsui and Elana Herzog. Assembled from deconstructed Ohio law books, Jones’s work is grid-like, forming what may be perceived as swatches, shingles, plots of land, and even military uniform designs. This mode of abstract collage or pastiche leads to multiple interpretations, much like how laws themselves can be interpreted in various ways depending on the context and the predispositions of the examiner/interrogator. In the same instant, the work also forms a quilt-like fabric that is representative of how laws are meant to bind society. The production of Gris within the context of recent mass movements dedicated to criminal justice reform along with various appellate courts nationwide being tested by controversial Executive Orders all contribute to viewers’ understanding of this work. Gris seems to both hold the hopes we have for American jurisprudence and lays bare its inherent institutional flaws. Through the use of recycled reference material and abstract associative forms, Jones asks us to consider who the law serves or benefits, and how certain biases and assumptions have been woven into the American judicial system at every level based on who writes and interprets legal codes and statutes. Jean Shin, Spring Collection, Looks 1, 2016. Leather remnants and t-pins. Courtesy of the artist. The artists discussed so far—and my analysis of the themes in their work—have focused on artifacts, the history of civilizations, systems of power, and the societal structures that both hold nations together and can be the source of their destruction. The latter half of this long-form exhibition review will continue to touch upon some of these themes while engaging with the installations of Jean Shin, Shinique Smith, Lina Puerta, and Maren Hassinger. Along one of the long walls of the gallery there is a four-part installation by Jean Shin titled Spring Collection [Figure 8], a playful title that cues the viewer to think about the fashion industry and the cycles inherent in its operation. The 8th Floor’s proximity to the Garment District and its storied past in New York City intensifies the critiques embedded in Shin’s work. At first glance the jagged leather remnants tacked to the wall appear as suspended political districts or even zoning maps. Within the context of the exhibition this reading is supported, but it may not have been what Shin had in mind when she produced this series during her 2016 residency at Materials for the Arts (MFTA). These sartorial scraps were sourced from leftover fabrics used in the production of luxury handbags. Like much Shin’s oeuvre this particular series calls attention to wasted materials and might be understood as a condemnation of the American mass production-consumption-disposal model. With Shin’s work that utilizes garments and fabrics, there is a conversation about labor and value. The material counterparts to the strips of leather in Spring Collection now form constituent parts in high-end handbags, whose value is calculated in part by the materials, manual labor, and brand name. The discarded bits that Shin recycled to form Spring Collection would have had little to no value. Instead, in this unexpected afterlife, they hold appreciable value as components in an art installation by a renowned artist both because of the ideas grafted upon them and for simply being affiliated with the artist’s name. In this sense, her work is a variation on the theme of intervention and afterlife. Shin forces us to examine the construction of value in both the fashion industry and the art world, and the institutions and individuals driving the fluid concept of value. Like Shin’s body of work, Shinique Smith has developed a signature style and practice using bundles of castoff clothing in order to engage in dialogues about economies of waste and excess, and the agents driving these cycles. It’s a New Day from 2014 [Figure 9] is a bundle of fabrics suspended from the ceiling, calling to mind molecules, atomic structures, planetary systems, and gravitational forces. The title of another work, Progenitor (2016), further suggests this association with quantum and universal forces. What is more, these bales resemble the satchels of nomadic peoples in the developing nations from which Smith has sourced the bulk of her garments. Perhaps no artist’s practice better embodies one of the driving contentions of this exhibition, the contention “that disused, discarded objects, and quotidian gestures, accrue new meaning and value through the process of making art, demonstrating symbolic and literal reversals of the decay associated with ecological loss, and its entanglement with the geopolitics, culture, and safety of our planet.” Smith’s visual forms serve as apt metaphors in which to offer critical commentary on the material exchange of wealth and products in the global economy. Just as there are larger intangible forces or laws that govern the interaction of constituent parts at atomic and cosmic levels, so too are there hidden economic forces governing how the developed world interacts with the developing. Indeed, Smith is looking at how the global center relates to the periphery and all its invisible laborers. In this respect, Smith’s work is comparable to Laderman Ukeles, who extensively documented the unseen and often un-appreciated labor of thousands of New York City sanitation workers. It is also worth noting that the different designs on the found textiles suggest individual identities and personalities behind the patterns, linking the fabrics to those who produced them andthose who once wore them. As one of the nearby text panels explains, much of “Smith’s raw material has been produced in the developing world, and continues to circulate the globe, crossing through different economic zones as recycled materials.” Smith’s work dovetails nicely with Jean Shin’s leather straps, which conceivably might be seen as mapping out these economic zones through her cut-out forms. Both artists disrupt, intervene in the normal cycle of use and disposal in order to bring viewers in the developed world face to face with the waste of contemporary consumption habits and unravel the unseen power dynamics at play. If the work of Shin and Smith can be said to be dealing with the nature of fashion, then Lina Puerta’s installations might be described as exploring the fashion of nature: humanity’s manipulation and decoration of nature, i.e. architecture. Working within the realm of camp aesthetics, Puerta probes the historically and contemporaneously tense relationship between nature and culture. The installations from her ongoing Botánico series investigate how nature supplies the raw materials of artistic production, and how nature supports the structures we inhabit, from the intimate spheres of domesticity to grand urban engineering feats. While Puerta encourages viewers to be more aware of nature in our everyday environs, there is also a rather cynical undercurrent present in her work. As seen in Untitled (Tree and Frame) from 2014 [Figure 10], her use of beads, sequins, and other artificial decorative objects call to mind the act of adornment on the body, seeing the earth as a body decorated with the trappings of humanity (read architectural structures). Anchored on columns and in corners, as if penetrating the pristine white cube, her installations suggest that in time all human artistic and architectural marvels will be overrun by nature and retrospectively appear as futile efforts, like adorning fake moss with strands of beads. To a certain degree, Puerta’s work might be read as a kind of memento mori (magnificum) and as such continues the conversation about the history of civilizations started by the first works in the show. Within the context of this exhibition, Puerta’s works take on new meaning when placed in proximity with the work of Elana Herzog and Mierle Laderman Ukeles, encouraging viewers to understand the issues of climate change, natural disasters, and the history of civilizations as all being intertwined. Related to this notion of the tension between the natural and built environments is Maren Hassinger’s series of work from 1982 called Pink Trash [Figure 11]. One installation and three inkjet prints documenting the artist’s 1982 performance comprise Hassinger’s contribution to the show. As part of the Art Across the Park Initiative, Hassinger collected white pieces of trash, painted them pink, and placed them back where she initially found them. Like Shin, Smith, and others, Hassinger intervened in the life of castoff objects in order to give them new meaning and offer a critique of the larger system these objects are part of. Her commissioned, site-specific performance was an attempt to call New Yorkers’ attention to the shared responsibility of maintaining public places. The choice to paint the trash pink was motivated by color theory since pink and green are complementary and therefore more noticeable. To my mind, reflection on Hassinger’s intervention and experiment leads to considerations about the parallels between color theory and competing theories about society and urban planning. Art Across the Park took place in New York City’s three largest parks: Central Park, Prospect Park, and Van Cortlandt Park. All of these public lands were designed by landscape architects who understood public parks as antidotes to the ills of industrialization and the urban environment. Hassinger’s performance in 1982 and its re-staging in 2017 can therefore be understood as contemporary activations of many of the original ideas, theories, and concerns undergirding the design of these parks. The exhibition presents the manual and artistic labors of twelve artists attempting to elaborate potential solutions to systemic problems that we navigate and participate in every day, either consciously or unconsciously. Cumulatively, these thought-provoking works and the underpinning curatorial vision offer examples of intervention and hope for the history of humanity. Reisman included the following evocative excerpt from Smithson’s 1968 essay toward the end of the exhibition catalogue: “A rubble of logic confronts the viewer as he looks into the levels of the sedimentations.” The geological recording of history takes place through the destruction, accumulation, and accretion of various sediments. These layers of natural debris coalesce, transform, and create new forms through a series of tectonic cycles and processes. The artists assembled by Reisman engage in a parallel process of gathering fragments or cast-off material in order to give rise to artistic sedimentation. Like the geological equivalent, these installations—which might also be called cultural accretions—can be examined in order to glean information about the conditions of a particular time and place. However, unlike layers of rock that tell a story that has already been written, the assemblages found at The 8th Floor elaborate narratives about present conditions; the historic record is not yet set in stone. The sculptures and installations on display are presented to viewers to contemplate, interpret, and take action upon the systems, cycles, and crises that each artwork takes aim at. Just as these individual artists have intervened in the lives of objects and materials in order to disrupt original trajectories, we as spectators are urged to intervene in the failing systems that surround us, from the criminal justice system to gun regulation to climate change. As Foucault put it, history is about ideas, beliefs, institutions, practices, and ordinary people caught up in the web of power relations that structure their lives. History is not on some inexorable march toward progress or utopia; now more than ever in the Anthropocene we must step in to correct course. The 8th Floor is located at 17 West 17th Street. The gallery is open to the public Tuesday through Saturday from 11:00 a.m. until 6:00 p.m., and the show will remain on view until December 8, 2018. To read full essay with illustrations by Tony at AEQAI, please click here. Michel Foucault, The History of Sexuality: An Introduction, trans. Robert Hurley. London: Penguin (1990). I am immensely grateful to curatorial assistant George Bolster for arranging a private viewing of this exhibition. It is worth noting that the year 1968 is also a significant date in the life of Foucault (along with a host of other French Continental philosophers) because of the 1968 May riots. The protests were composed of French factory workers, farmers, students, and intellectuals, and brought about a social and cultural revolution that markedly changed institutions and attitudes in France. As such, these events marked a turning point in the history of Western thought and critical theory. Sara Reisman, “Sedimentations: Assemblage as Social Repair,” New York: Shelley & Donald Rubin Foundation (2018), 3. Visani’s criticism of firearm accessibility and regulation (or lack thereof) is chiefly aimed at communities situated in the Western world. Claire Armitstead, “Fourth Plinth: How a Winged Bull Made of Date Syrup Cans Is Defying ISIS,” The Guardian, 26 March 2018. https://www.theguardian.com/artanddesign/2018/mar/26/michael-rakowitz-invisible-enemy-should-not-exist-fourth-plinth-winged-bull-date-syrup-cans-defying-isis. Wall label, Michael Rakowitz, May the Obdurate Foe Not Stay in Good Health, New York, The 8th Floor, 18 August 2018. Dr. Samuel Andrew Hardy is a criminologist, historian, and archaeologist specializing in the illicit trade in antiquities, the destruction of cultural property, and the politics and ethics of cultural heritage work in conflict zones and divided societies. In New York for example, Robert Moses was a key figure in designing public parks and highways that consciously excluded individuals of lower socio-economic levels. For a primer on the life and career of Moses, see “Robert Moses,” The New York Preservation Archive Project, accessed 12 September 2018, http://www.nypap.org/preservation-history/robert-moses/. The catastrophic events and government responses to Hurricane Katrina, Hurricane Maria, and the on-going Flint Water Crisis are a few examples that come to mind most readily. Lina Puerta and Michael Kelly Williams also participated in programs at Materials for the Arts, and the products of their respective residencies are featured in the exhibition as well. Exhibition Statement, Sedimentations: Assemblage as Social Repair, New York, The 8th Floor, 18 August 2018. I am broadly drawing upon the scholarship of Immanuel Wallerstein and how he has written about world-system theory. Joint wall label, Shinique Smith, Progenitor and It’s a New Day, New York, The 8th Floor, 18 August 2018. It should also be noted that much of Puerta’s work is concerned with deconstructing the artificial binary set up between gendered codes of behavior. In the Botánico series, she seems to merge discourses on gender, sexuality, and the environment. Frederick Olmsted, Calvert Vaux, and Samuel Parsons, Jr. were pioneers in their field and their designs continue to shape individuals’ experience of these significant public spaces today. Michel Foucault, Discipline & Punish: The Birth of the Prison, trans. Alan Sheridan. New York: Vintage Books (1995), 195-228.